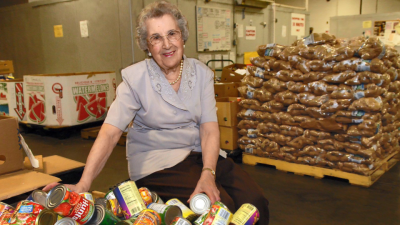 This year, the Gemma E. Moran United Way/Labor Food Center is celebrating its 30th anniversary of alleviating hunger and food insecurity in New London County. The event will be held at the Food Center (374 Broad Street in New London) on Friday, October 12th from 11 a.m. to 2 p.m. A brief program will occur at 12:30 p.m. Guests may join us at any time during the two-hour window. The event will also serve to kick off the annual United Way fundraising campaign. We're honoring partners, old and new alike, who have made it possible for our Food Center to help families facing hunger for thirty years, while recognizing the need for United Way's funded partners and the vital safety net they provide in our community. Former and current volunteers and labor leaders, many of whom helped to establish the Food Center, will help in the celebration as will Gemma Moran herself and Sara Chaney, one of the original staff members who still works there. Rodney Butler, chair of United Way’s Board of Directors, will serve as host for the program. Established in 1988 to assist laid off workers and their families, the program has grown to provide more than 2.1 million meals and snacks through 84 distribution sites in the county, at no cost to those in need. 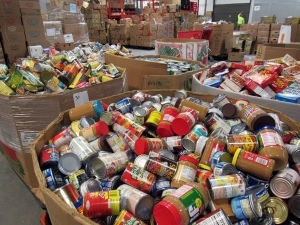 Distribution sites include 74 free, emergency food programs including pantries and meal sites, as well as ten monthly distributions of its Mobile Food Pantry. Activities planned for the event include games, music, a cookout lunch, photo booth and tours of the Food Center’s warehouse. Individuals attending are asked to bring donations of cereal and/or oatmeal as these are some of the most-needed items of the Food Center’s member agencies at the moment. Please click here to register and help us honor Gemma Moran and her dream! Many thanks to Charter Oak Federal Credit Union for sponsoring this event so that no donor dollars will be used. Charter Oak was one of the very first partners who made it possible for Gemma's dream to come true.